The development of an ecological model may involve problems of uncertainty. Ecologists have to deal with imprecise data, ecosystem variability, complex interactions, qualitative aspects, and expert knowledge expressed in linguistic terms. In all these cases, fuzzy logic could provide a suitable solution. Fuzzy logic allows to: use uncertain information such as individual knowledge and experience; to combine quantitative and qualitative data; to avoid artificial precision and to produce results that are found more often in the real world. Developed in the late sixties as a method to create control systems when using imprecise data, fuzzy logic has been used for a very large number of engineering applications, and more recently to develop models of air, water and soil ecosystems. The following sections of this chapter introduce the basic structure of a fuzzy model, describing the variety of options that exist at each stage. An example of fuzzy model is also outlined: the knowledge-driven development of an index of water quality having five qualitative output classes. Finally, possible future developments of fuzzy modelling in ecology are suggested##. Fuzzy logic is a mathematical theory developed to represent imprecise and uncertain knowledge, using words as mathematical tools. Why is fuzzy logic suitable to build ecological models? Fuzzy logic allows to: easily manage qualitative data as well as quantitative data, represent complex structures and dynamics, use vague data and linguistic knowledge. Therefore, it is suitable for ecological models, which are characterised by high complexity and uncertainty. What is the innovative aspect of fuzzy logic? Fuzzy logic introduces the concept of partial membership by means of membership functions. They express the relationship between independent variables and their underlying characteristics. A membership function associates an input value to a membership grade between 0 and 1. Membership functions can overlap, meaning that a variable value can be simultaneously associated to different characteristics with different grades. How is the a fuzzy system structured? A fuzzy system is typically composed of three stages: fuzzification, inference and defuzzification. First, numerical values of input variables are transformed into membership grades (fuzzification). Second, membership grades are processed through a set of if…then rules, thus producing a fuzzy output (inference). Third, the fuzzy output can be further converted into a quantitative or qualitative output (defuzzification). Fuzzy models are flexible and can be adapted to respond to different requirements: within this general scheme, there are different strategies to perform fuzzification, inference and defuzzification. How membership functions, inference rules and defuzzification strategies can be chosen amongst the many possibilities? Simple fuzzy systems can be created using common spreadsheet environments such as Microsoft Excel, available at http://www.microsoft.com, or the free open-source counterpart, OpenOffice Calc, available at http://www.openoffice.org. They allow one to design membership functions, calculate if…then rules and defuzzification algorithms, plot 2D graphical results. They are well-known and intuitive programs, but do not display specific tools for fuzzy models, thus the model designer needs to have the structure of a fuzzy model very clear in mind and has to create formulas by hand. Another limit is that they lack flexibility: it can be rather difficult to modify an existing model. Even simple changes in the structure might require a deep re-organisation of the spreadsheet, making this solution suitable for simple models only. fuzzyTECH (Inform Software Corporation 2001) is a leading software for fuzzy systems development; it is available at http://www.fuzzytech.com. Amongst its user-friendly features, it is worthwhile mentioning: a linguistic variable editor that plots membership functions, spreadsheet rule editors, choice among different types of logical operators, analysers that plot simulation results in 3D and help in the optimization process. An intuitive graphical user interface makes development of fuzzy systems fast and efficient. The available NeuroFuzzy Module integrates neural network technologies in order to train or optimize fuzzy logic systems. The MathWorks’ Matlab, the popular developer of technical computing software, offers a Fuzzy Logic Toolbox which is a very common choice for fuzzy systems development (Jang and Gulley, 1995). The model design is supported by graphical user interfaces, including editors for membership functions and rules, and 3D plotter. Algorithms for fuzzification, inference and defuzzification can be customized, thus offering a flexible instrument. It also allows techniques of data analysis (fuzzy clustering), or data-learning (Adaptive Neuro-Fuzzy Inference System, ANFIS). The ANFIS editor allows to shape membership functions by training them with input/output data rather than specifying them manually. It is available at: http://www.mathworks.com/products/fuzzylogic. F-IND (Marchini et al. 2009) is a framework to create multivariable fuzzy indices by means of a simplified and intuitive procedure. The user is only required to define input variables with relative membership functions, and output classes. The software uses the information contained in membership functions to define weights and rules automatically. 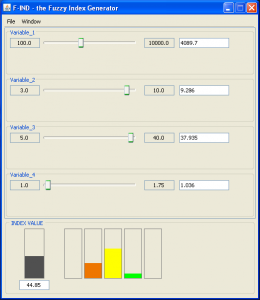 It is suitable also for non-experts of fuzzy formalism, and generates a graphical user interface to calculate index values from input data. F-IND is a free open-source software, written in the Java programming language, and it is available at: http://robot.unipv.it/F-IND. 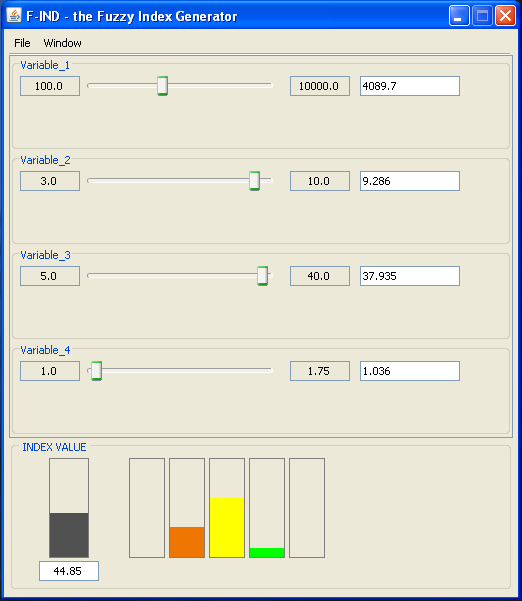 The figure belows shows an example of the F-IND graphical user interface. CHLfuzzy: an example of application for the fuzzy modeling of chlorophyll concentrations in coastal lagoons. Link to the model (in spreadsheet format) and to the instructions.